Have you ever had those days when you were hungry and all you had were a few ingredients? Even though, I like the partially old yam, it’s new yam season and with no rice in sight, I made this bowl of yam pottage stew. I have not always been an ajebutter. Growing up, there were times when things were quite tough. There were days when mother made native soup with coco yam and tiny bush snails. We also ate palm oil rice and yam pottage stew. I call this dish pottage stew because of it’s slightly soupy nature. 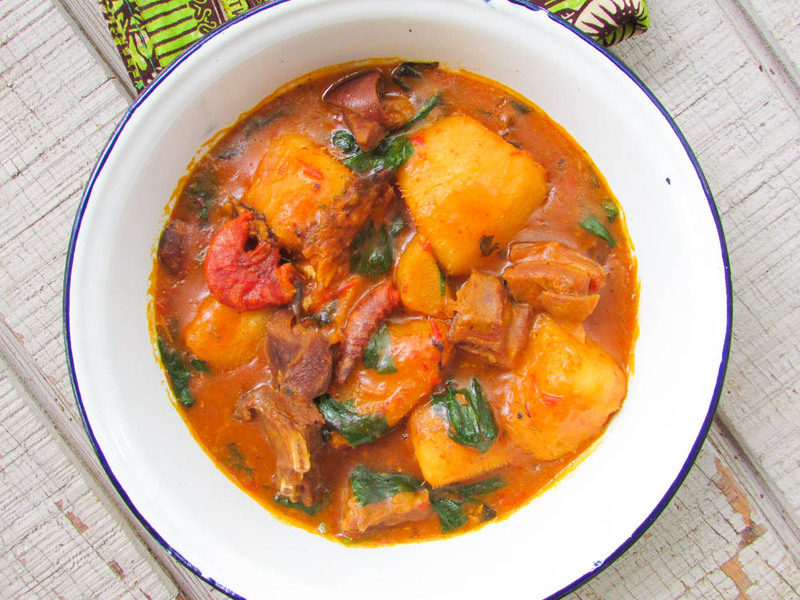 It’s not squishy or really broken down like the regular Asaro or Igbo version of yam pottage(ji’ akukwo). It’s made to fill whomever may be eating it and not only with comfort, but in the belly too. As I cooked this pot of stew, a little bit of tears rolled down my eyes and unto my cheeks as I remembered my father. I remembered how hard things were at some point, I remembered how hard my mother worked and how this road helped me to grow to appreciate the little things that were done for me. Things weren’t always tough for us. We lived as a middle class family when my father worked at NNPC(Nigerian National Petroleum Coporation). NNPC is a company through which the federal government of Nigeria regulates the production and sale of oil in Nigeria. While daddy worked there, we ate well, lived in a safe environment(NNPC housing estate) and had all our ajebutter friends to play with lol. My father worked as a supervisor at the Jetty. I remember him explaining to us once that the Jetty was the place through which the oil was brought and shipped out after being processed. He said each production of oil and it’s sales could feed the whole of Nigeria for a month without any problem. At some point, my father was retired and we had to move out of the estate to an accommodation we could afford. I was quite young and really didn’t understand why we had to move. We eventually became a government of ourselves; as it is with most Nigerian citizens. We had to get our own water, our own security, transportation and power. We always had a farm, so we ate pretty much all we grew and that helped us a great deal. My dad poured his money into his bread business and we fell on hard times. That was when I knew that those little snails that fed on flowers and plants were edible. Those times, I didn’t have a choice, I ate what mother cooked; this yam stew inclusive…Until my father was able to stand on his feet financially, we had to struggle, just to live. At some point, I had to help him hunt for costumers to patronize his business and I just have to say that in many ways, I am ecstatically grateful for the hard times we went through, because now I have recipes and experiences to share. Roast the ehuru over open flame or toast in a hot pan until fragrant. Roughly or smoothly blend or pound it along with half of the whole dry prawns and the habanero pepper. 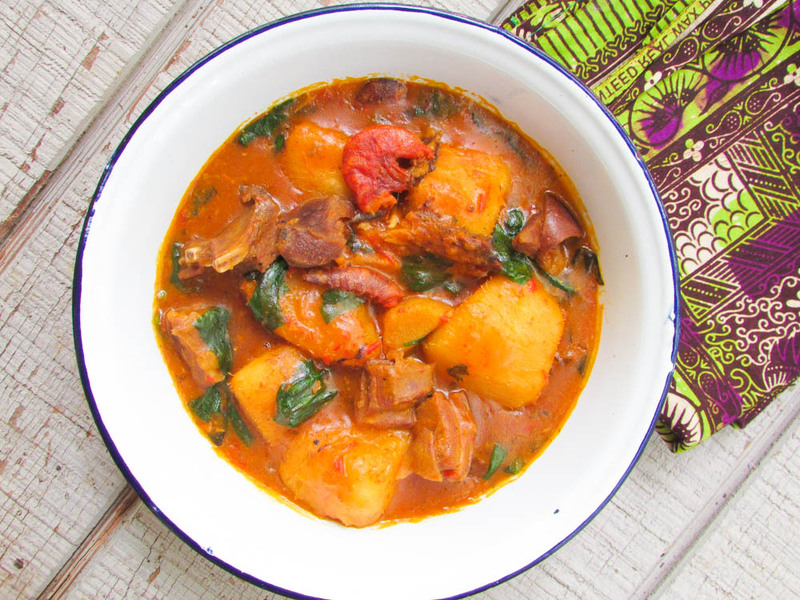 This entry was posted in Local dishes, pottage, Uncategorized, Yam, Yam dishes, Yam pottage and tagged Nigerian food blog, Nigerian yam recipe, Pottage yam recipe, yam pottage recipe, yam stew recipe.